12” x 12” nail-up metal tiles or panels are suitable for smaller areas and work well in backsplash applications in kitchen, bathrooms, bars and other similar areas. They can also be used in wainscoting applications for an even more unique look. 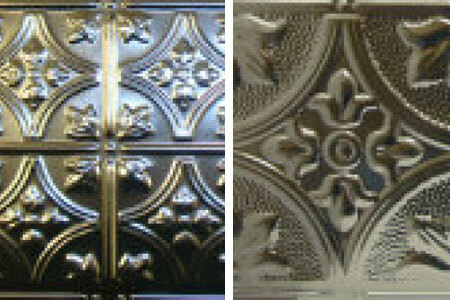 These 12in x 12x nail-up metal panels are available in 14 different patterns and are only available unfinished. Please note that these panels are suitable only for nail-up installation. Example: 12" #102 showing Nail-Rail edges that come on all 12" tiles!